Durham County Council has welcomed the recruitment of its first degree apprentices, who will work as part of the council’s planning and assets team. The apprentices, who will also study at Northumbria University, will be funded using the apprentice levy, which was introduced by the Government in April 2017. This will save the council £81,000 in training costs, and has potential to be rolled out across the rest of the council and could result in annual savings of up to £2million. Cllr Carl Marshall, Durham County Council’s Cabinet member for economic regeneration, said: “We are excited to have established three new degree apprentices within our service which helps to address both our immediate and long term workforce planning needs. “Within months of starting, all three have made a positive impression, have been active in making improvements, and we look forward to what the future will bring. “This is a great opportunity to not only get a university degree but also the essential work experience that many find difficult to get. “Growing our own stars of the future is an important strand of attracting new talent, and at the same time providing exciting new opportunities for our young people. 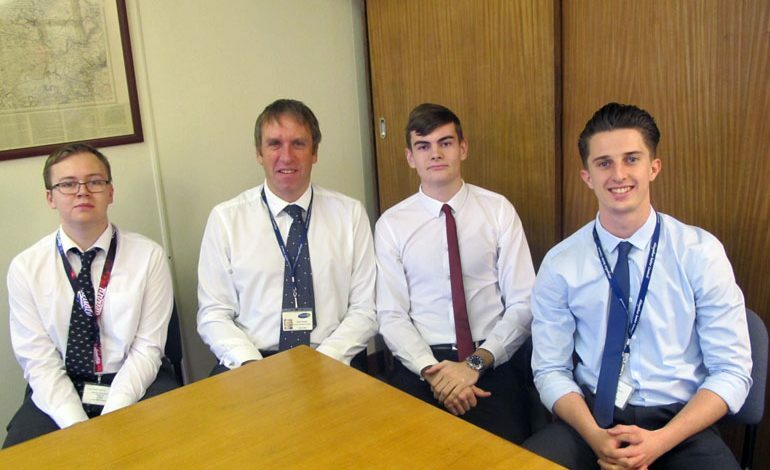 Apprentices Adam Marr, Daniel Knowd, and Jamie Gargett will each divide their time between working for Durham County Council and studying for a degree at Northumbria University. The new recruits are already part of Durham County Council’s new Apprentice Think Tank, which seeks to provide a fresh perspective on the day-to-day workings of the council, and suggest innovative solutions. Susan Dawson, Northumbria University’s apprenticeship programme lead, said: “We are extremely proud of the degree apprenticeship route at Northumbria University and are delighted that Durham County Council has made a significant commitment and investment to take advantage of this route to producing the next generation of chartered surveyors. “The route has been developed in collaboration with industry and the Royal Institution of Chartered Surveyors. Durham County Council’s planning and assets team will also be looking to recruit more degree apprentices next spring, with details due to be released. • Pictured above (left to right): Degree apprentice Jamie Gargett, head of planning and assets Stuart Timmiss and apprentices Adam Marr and Daniel Knowd.